Can was an experimental rock band formed in Cologne, West Germany in 1968. Later labeled as one of the first “krautrock” groups, they transcended mainstream influences and incorporated strong minimalist and world music elements into their often psychedelic music. 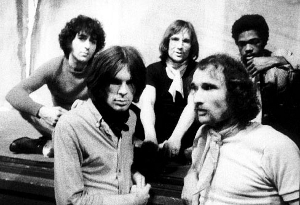 Can constructed their music largely through collective spontaneous composition –– which the band differentiated from improvisation in the jazz sense –– sampling themselves in the studio and editing down the results; bassist/chief engineer Holger Czukay referred to Can’s live and studio performances as “instant compositions”. They had occasional commercial success, with singles such as “Spoon” and “I Want More” reaching national singles charts. Through albums such as Monster Movie (1969), Tago Mago (1971), Ege Bamyasi (1972) and Future Days (1973), the band exerted a considerable influence on avant-garde, experimental, underground, ambient, punk, post-punk, new wave and electronic music. The roots of Can can be traced back to Irmin Schmidt and a trip that he made to New York City in 1968. While Schmidt initially spent his time with avant-garde musicians such as Steve Reich, La Monte Young and Terry Riley, he was also eventually exposed to the world of Andy Warhol, Hotel Chelsea and, perhaps most importantly, The Velvet Underground. In his own words, the trip “corrupted” him, sparking a fascination with the possibilities of rock music. Upon his return to Cologne later that year, an inspired Schmidt formed a group with American avant-garde composer and flautist David C. Johnson and music teacher Holger Czukay with the intention of exploring his newly broadened horizons. Up to that point, the inclinations of all three musicians had been exclusively avant-garde classical. In fact, both Schmidt and Czukay had directly studied under the influential composer Karlheinz Stockhausen. Schmidt chose to play organ and piano, while Czukay played bass and was able to record their music with a basic two-track tape machine. The group was soon fleshed out by with guitarist Michael Karoli, a 19-year-old pupil of Czukay, and drummer Jaki Liebezeit, who had grown disenchanted with his work in free jazz groups. As the group developed a more rock-oriented sound, a disappointed Johnson left the group at the end of 1968. The band used the names “Inner Space” and “The Can” before finally settling on “CAN”. Liebezeit subsequently suggested the backronym “communism, anarchism, nihilism” for the band’s name. In mid-1968, the band enlisted the creative, highly rhythmic, but unstable and often confrontational American vocalist Malcolm Mooney, a New York-based sculptor, with whom they recorded the material for an album, Prepared to Meet Thy Pnoom. Unable to find a recording company willing to release the album, the group continued their studio work until they had material for what became their first release, Monster Movie, released in 1969. This album contained new versions of two songs previously recorded for Prepared to Meet Thy Pnoom, “Father Cannot Yell” and “Outside My Door”. Other material recorded around the same time was released in 1981 as Delay 1968. Mooney’s bizarre ranting vocals emphasized the sheer strangeness and hypnotic quality of the music, which was influenced particularly by garage rock, psychedelic rock and funk. Repetition was stressed on bass and drums, particularly on the epic “Yoo Doo Right”, which had been edited down from a six-hour improvisation to take up a mere single side of vinyl. Liebezeit’s tight but multifarious drumming was crucial in carrying the music. Mooney returned to America soon afterwards on the advice of a psychiatrist, having been told that getting away from the chaotic music of Can would be better for his mental health. The liner notes of Monster Movie claim that Mooney suffered a nervous breakdown (“caught in a Can groove”), shouting “upstairs, downstairs” repeatedly. He was replaced by the more understated Kenji “Damo” Suzuki, a young Japanese traveller found busking outside a Munich cafe by Czukay and Liebezeit. Though he only knew a handful of guitar chords and improvised the majority of his lyrics (as opposed to committing them to paper), Suzuki was asked to perform with the band that same night. The band’s first record with Suzuki was Soundtracks, released in 1970, a compilation of music made for films that also contained two earlier tracks recorded with Mooney. Suzuki’s lyrics were usually in English, though sometimes in Japanese (for example, in “Oh Yeah” and “Doko E”). Suzuki left soon after the recording of Future Days to marry his German girlfriend, and become a Jehovah’s Witness. Vocals were taken over by Karoli and Schmidt; however, after the departure of Suzuki, fewer of their tracks featured vocals, as Can found themselves experimenting with the ambient music they had begun with Future Days. Soon Over Babaluma from 1974 continued in the ambient style of Future Days, yet it regained some of the abrasive edge of Tago Mago and Ege Bamyasi. In 1975, Can signed to Virgin Records in the UK and EMI/Harvest in Germany, appearing the same year on BBC’s Old Grey Whistle Test where a memorable performance of Vernal Equinox involved Schmidt playing one keyboard section with a series of rapid karate chops. Shortly after the appearance Schmidt suffered a broken leg which led to cancellation of the band’s UK tour. The later albums Landed (1975) and Flow Motion (1976) saw Can moving towards a somewhat more conventional style as their recording technology improved. Accordingly, the disco single “I Want More” from Flow Motion became their only hit record outside Germany. Co-written by their live sound mixer Peter Gilmour, it reached No 26 in the UK charts in October 1976, which prompted an appearance on Top of the Pops, where Czukay performed with a double bass. In 1977 Can were joined by former Traffic bassist Rosko Gee and percussionist Rebop Kwaku Baah, both of whom provided vocals to Can’s music, appearing on the albums Saw Delight (1977), Out of Reach (1978) and Can (1979). During this period Holger Czukay was pushed to the fringes of the group’s activity; in fact he just made sounds using shortwave radios, Morse code keys, tape recorders and other sundry objects. He left Can in late 1977 and did not appear on the albums Out of Reach or Can, although he was involved with production work for the latter album. The band seemed to be in a hiatus shortly afterwards, but reunions have taken place on several occasions since. Since the split, all the former members have been involved in musical projects, often as session musicians for other artists. In 1986 they briefly reformed, with original vocalist Mooney, to record Rite Time (released in 1989). There was a further reunion in 1991 to record a track for the Wim Wenders film Until the End of the World, and Can have since been the subject of numerous compilations, live albums and samples. In 1999 the four core members of Can, Karoli, Liebezeit, Schmidt and Czukay, performed live at the same show, although playing separately with their current solo projects (Sofortkontakt, Club Off Chaos, Kumo and U-She respectively). Michael Karoli died of cancer on 17 November 2001. In 2004, the band began a series of Super Audio CD remasters of its back catalog, which were finished in 2006. Holger Czukay has recorded several ambient albums and collaborated with David Sylvian among others, while Jaki Liebezeit has played extensively with bassists Jah Wobble and Bill Laswell, and in a drum ensemble called Drums of Chaos, and in 2005 with Datenverarbeiter on the online album Givt. Michael Karoli recorded a reggae album with Polly Eltes before his passing, and Irmin Schmidt has begun working with the acclaimed drummer Martin Atkins, producing a remix for the industrial band The Damage Manual, and a cover of “Banging the Door” for a Public Image Ltd tribute album, both released on Atkins’ label, Invisible Records. Karoli formed Sofortkontakt! for the Can reunion shows in 1999 with Mark Spybey, who had previously been associated with Dead Voices on Air, Zoviet France, Reformed Faction and Download. The band also featured Alexander Schoenert, Felix Guttierez of Jelly Planet and Mandjao Fati. Karoli also performed on numerous occasions with Damo Suzuki’s Network. Damo Suzuki returned to music in 1983, and since then he has been playing live improvisational shows around the world with local musicians and members of touring bands at various points, sometimes issuing live albums. Malcolm Mooney recorded an album as singer for the band Tenth Planet in 1998. Rosko Gee has been the bassist in the live band on Harald Schmidt’s TV show in Germany since 1995. Rebop Kwaku Baah died in 1983 following a brain hemorrhage.